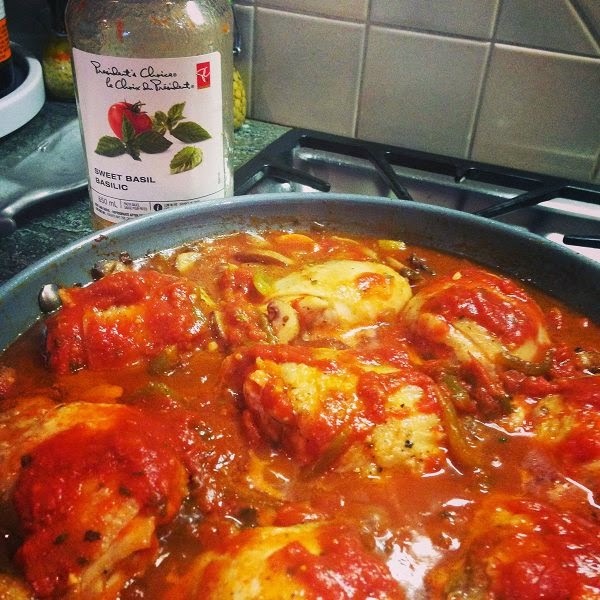 I could've and should've shared this recipe almost a week ago when I first made the chicken cacciatore but didn't because I felt awkward about sharing my recipe for chicken cacciatore right after sharing the eulogy I wrote for my mother. I spent a lot of time over the last week reflecting on my life and my recipe for chicken cacciatore, trying to make some grand and meaningful connection between chicken cacciatore and life, and came up with this conclusion: a really good recipe for chicken cacciatore isn't the answer to the meaning of life or the cure to my grief, it really is just a really good recipe for chicken cacciatore. My wasted hours of reflection weren't really wasted. I did have one light bulb moment. After months of questioning why and for whom I was writing this blog, I figured it out. I have to write it for me. I have to write it. For me. Sometimes I am so happy and I want to write down why I am so happy so that one day I can look back at this blog and remember that thing that made me so happy. Sometimes I am so sad that I need to write down why I am so sad because then it is out of my head...a little. Sometimes I am so MAD that I need to write down why I am so mad so that it is out my head...a little. And sometimes I just need to write out a great recipe. I suppose it's ok if you read it too. 2. Season the chicken with s & pepper; put it skin side down in the pan & brown for about 4 minutes on each side. Transfer to a plate and set aside. 3. Heat the remaining oil in the pan & add in the onions and stuff, season with salt and pepper and cook until it starts getting a bit soft and brown, stirring once in a while. 4. Add in the mushrooms, season again (do you see a pattern here? You're not supposed to add in all the s & p at the beginning or end, but layer it in). 5. After about 5-6 minutes, the mushrooms will have released their liquid and will be starting to caramelize. At this point, add in the wine to deglaze the pan (read: scrape up all the yummy caramelized bits). 6. Return the chicken to the pan, juices and all. Pour the tomato sauce on top of that, shuffle it around a bit, and then cover it up until the chicken is cooked through. About 10-15 min. 7. Serve over noodles or rice.